Gary Reighn from US has built himself an amazing cinema room in his Philadelphia home. 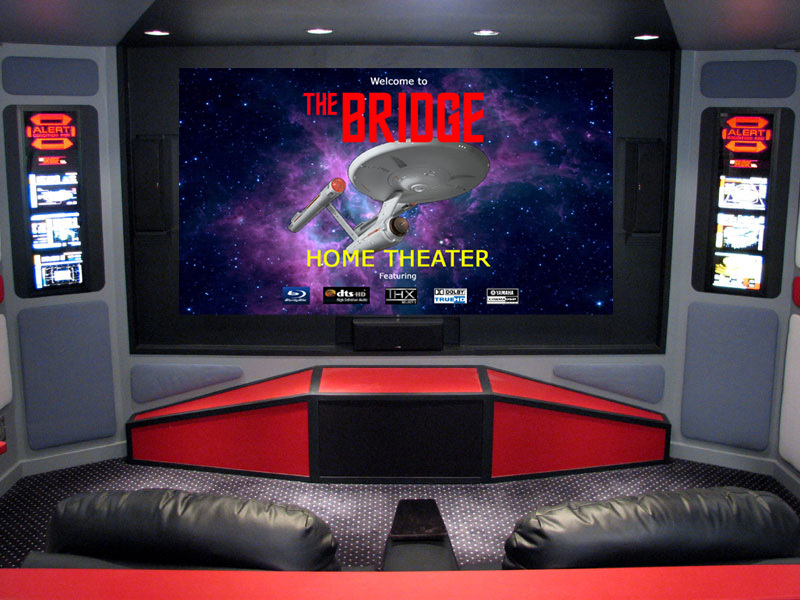 This self built home theater is based on the bridge from Star Trek’s USS Enterprise. Gary spent around 15’000 dollars converting his 19×14 foot basement into this Trekies paradise. The project took Gary around two years to complete and features a Sony LCD projector, a 7.1 Polk sound system, a Velodyne subwoofer, Yamaha receiver, Bravo DVD player, Philips Pronto remote and Bass Shakers beneath two of the theater’s chair. “Let me start off by saying that I am not a die-hard “Trekie”. While I do like the various incarnations of Star Trek on TV and film, I do not consider myself a fanatical fan. In building a home theater, I wanted something unique and fun. What better than a sci-fi themed theater based on a popular and recognizable franchise such as Star Trek. The first thing that occurred to me was the similarity between the bridge on the Enterprise and a small theater. The view screen made an obvious film screen and the seating centered around the command chairs and behind would fit well in the small space I had. I therefore decided to make my theater into a loose replica of the bridge sets from the various Start Trek TV shows and movies. The front wall would hold a large “view” screen. In the back, a two level seating area with access ramps down each side. A small railing would separate the two. Other details (computer displays, lighting effects, etc.) could be included to give it that spaceship bridge feel. Check out more pictures of Gary’s cinema room in the gallery below.